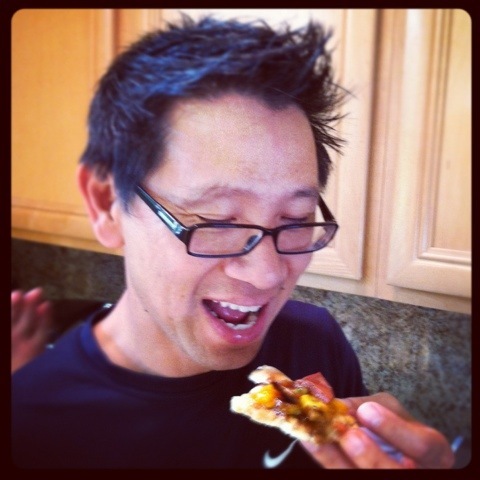 My 14-year old son Josh loves anything cooked by his best friend Sammy’s mom, Mary. “Mom, can you make me sandwiches like the ones Sammy’s mom makes?” I oblige by going to the supermarket and calling Mary on the cell phone in the aisles, asking her the exact brand of the bread, mayo, cold cuts, and cheese. I want to make sure that I reproduce her amazing sandwiches perfectly. Last month, Josh came home from an overnighter at Sammy’s. “How was your time there?” I ask. “Oh, the toast at breakfast…” he replies dreamily, which forces me to get on the phone once again. So the next morning, I serve my son toast with butter and Smuckers. 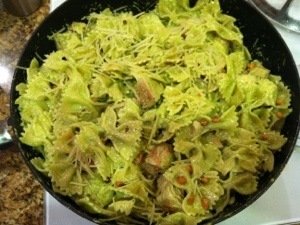 He then spends the next couple of days gushing about this pasta dish he had at Sammy’s house. “What was in it, Josh?” I ask. “Mmmm…I love toasted pine nuts, but it’s so easy to burn them,” I remark. Well, it was good to know that Mary is human, after all. From the description, it sounded like a dish I would also enjoy, so I called Mary one more time. 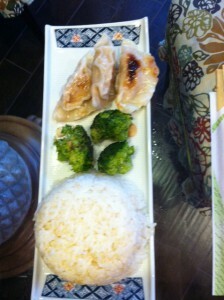 I got her recipe and made it for my family, and it was a hit. Even Josh thought it was good. Of course, not as good as when Sammy’s mom makes it, but good enough! Spread pine nuts on baking sheet and bake at 350 degrees until lightly browned. Prepare Pesto Butter. 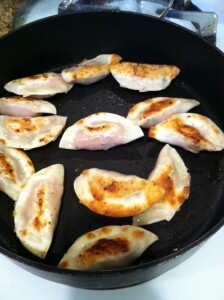 Cook chicken in frying pan until cooked through. Cut chicken into ½ inch wide bite-size strips. While chicken is cooking, boil pasta just until tender, drain well and set aside. In a wide frying pan, combine Pesto Butter and wine. Cook over medium heat, stirring occasionally, until bubbly (about 2 minutes). Stir in cream and bring to a full rolling boil, stirring often. 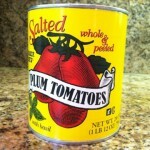 Season sauce to taste with salt then add roasted red pepper (2 tsp. can be too spicy for kids – I use about 1), pasta, chicken and Parmesan cheese. Mix lightly using 2 spoons. Sprinkle with remaining pine nuts. 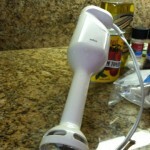 In a blender or food processor combine 2 tbsp. pine nuts, garlic, coarsely chopped parsley and basil, green onion, olive oil, butter and pepper. Whirl until well combined (about 2 minutes). 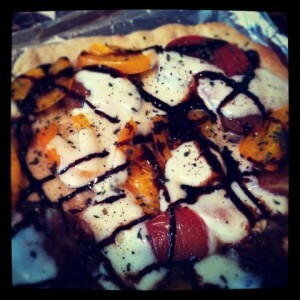 My post on facebook yesterday about making the Trader Joe’s Caprese Pizza was so popular, I thought I would share the recipe here with you. 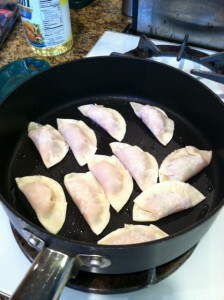 It’s super easy and very yummy! And really — Trader Joe’s is not paying money me to do this! Let pizza dough come to room temperature and roll out on well-floured cutting board. I rolled it into a rectangle which fit nicely onto a foil-lined cookie sheet, sprayed with non-stick oil. Brush with garlic olive oil and par-bake at 425 degrees for 6 – 7 minutes. The smell of the garlic olive oil will fill your home at this point. Remove tray from oven and arrange heirloom tomato slices (I used two large tomatoes) and and fresh mozzarella cheese slices in overlapping rows and sprinkle dried basil on top. Return to oven and bake for additional 4 – 5 minutes or until cheese melts (which took me more like 7 – 8 minutes). 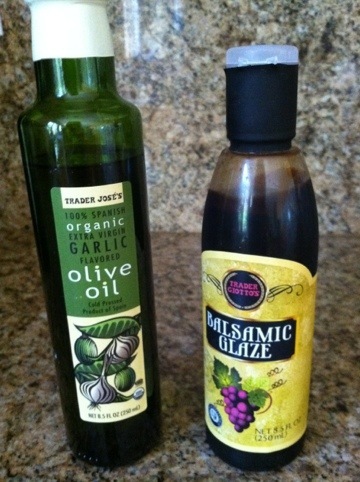 Remove from oven and drizzle balsamic glaze over slices. Cut and serve. If you have a pizza stone, it might be better to use that instead of my foil-lined baking sheet. The middle stayed a bit soggy for my taste, while the pizza stone would have absorbed the liquid a little more readily. 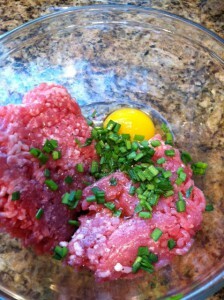 But in either case, this was easy and delicious, just in time for your summer entertaining. Share with us some easy recipes like this one! We Panda Moms want to know. 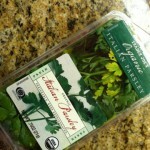 Here's TJ's Italian parsley, but you can get them anywhere. 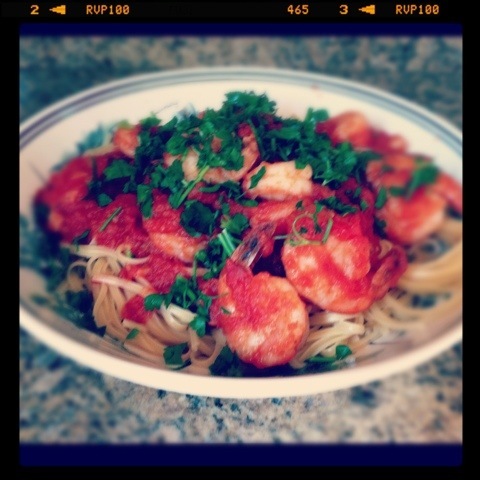 This is a tasty and easy recipe for pasta and shrimp lovers, ready in about 20 minutes. 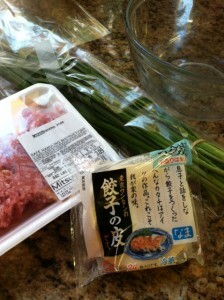 Most of the ingredients come from Trader Joe’s, but of course you can go anywhere else you like to purchase them. 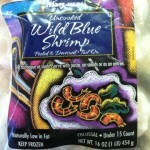 I use this frozen, peeled, deveined shrimp from TJ's, but you can get them anywehre. Best if not precooked. I finally get to use my burr mixer which we got as a wedding gift! Start boiling water for your linguini and follow the package directions. 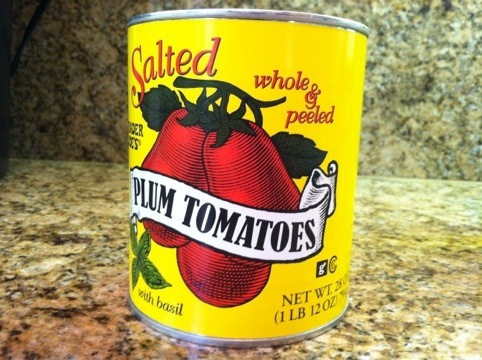 Meanwhile, simmer tomatoes in a sauce pan to reduce — about 20 minutes — then hit with a burr mixer to break up the tomatoes. (Yes, right in the pan. 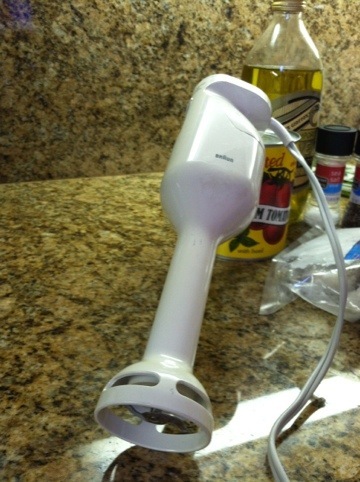 If you only have a regular blender, you’ll have to transfer to the blender and mix. Not as fun.) Reserve. In a large frying pan over medium heat, saute garlic and chilies in olive oil until you smell the aroma and before the garlic burns (do not use if it burns. It will taste bitter!). Add shrimp and sear on both sides, but do not cook through. Add wine and poach the shrimp, then add the reduced tomato sauce and the parsley. Check sauce for salt and pepper. Toss with the cooked linguini. Serves about 4 or 5. Only cook pasta to al dente. 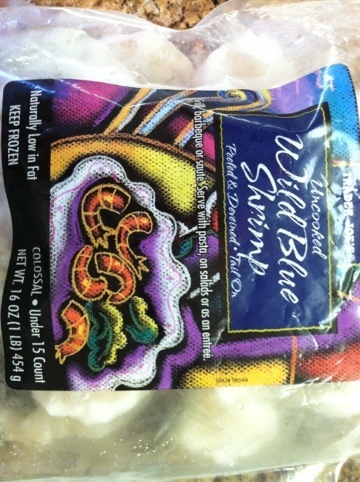 Do not overcook the shrimp — they will turn rubbery. Never burn garlic. Start over if you do. Never put grated parmesan cheese on seafood. 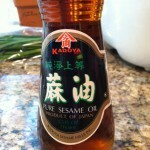 CostCo olive oil is one of the very best! If your splash of wine turns into a gush due to a slip of your hand, your children will complain bitterly that it tastes too alcoholic. Trust me. 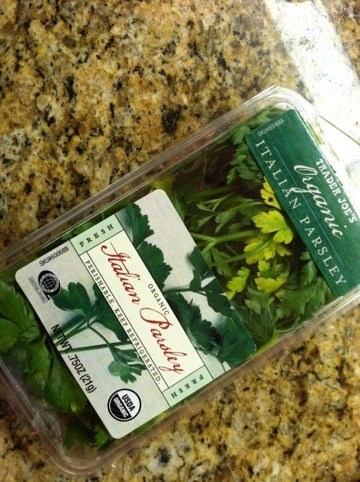 All the ingredients except the Italian parsley is non-perishable, so I keep all the ingredients around at all times so I can have a good, easy, quick recipe always ready to go in case a special guest suddenly shows up at our door. Anyone else want to share an easy recipe with us? Please add in the comments below!